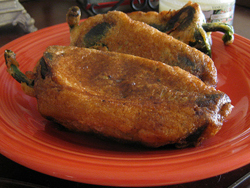 Chilies rellenos is made with either poblano or Anaheim chili peppers. Blanched, then stuffed with a Cheese or meat, breaded with a egg mixture and deep fried. Blanch or roast the peppers to make soft. Or use canned peppers to save a few steps. Once chilies have cooled cut a small slit in the pepper and carefully remove seeds if you do not like them too hot. Insert piece of cheese. Roll each pepper in flour to coat all sides, put on a plate and set aside. Beat yolks in another small bowl until fluffy and pale yellow, about 5 minutes. Beat in flour, water and salt. Gently fold in beaten whites. Heat 1/2 to an inch of oil in small skillet to 370°F. Place a length wise mound of egg batter about 1/2 inch thick and 3 inches wide on small saucer. Place chili in center and enclose using more batter on top if needed. Pepper should be completely enclosed with batter. Gently slide batter-coated chili into hot oil and fry 3 to 4 minutes until golden brown, turning with two slotted spoons or spatulas. Drain on paper toweling. Serve Chilies rellenos with Seasoned Tomato Sauce and sprinkle with chopped green onions. Blanch or roast the peppers to make soft. Or use canned peppers. To make the filling, brown the ground beef in a standard non-stick pan. When browned, add chopped tomato and onions. Stir in the taco seasoning. Turn off burner and prepare the batter and peppers. While the meat is browning you can make the batter. Beat egg whites in small bowl with electric mixer until soft peaks form. Beat yolks in another small bowl until fluffy and pale yellow, about 5 minutes. Beat in flour, water and salt. Gently fold in beaten whites. Cut an opening in the side of the chili. Make it large enough that stuffing can be put in, but not so large that the chili will fall apart. If you don't like your rellenos too hot, you can scrape out the seeds at this point. Stuff the chilies being careful to not tear the soft chilies. With a small spoon fill each chili with the meat mixture. Don't over stuff as you need to close the pepper. Hold it shut with a tooth pick if necessary so the meat does not fall out while frying. Coat the chilies with the flour and set on a plate. Heat oil in saute pan. Once heated turn to medium low temperature. Dip the floured stuffed chilies in the egg batter one at a time, gently place into pan of hot oil and fry until light brown on all sides. Serve Chilies rellenos with hot with rice, beans and tortillas chips.